First off, let me say that the head sculpt is great. That third eye just pops. But... does it look like Barney Phillips, the actor who brought 3EV to life? Um... no, not exactly, but I think it's about as close as possible without getting permission from Mr. Phillips' estate (remember, Bif Bang Pow! has permission to depict the character, not the actor; the exception being William Shatner). It's pretty damned close. However, I will say that I get a slight Phillip Baker Hall vibe from him. There, I said it. Let's move on. Well, there's the apron (which he's already wearing), which I guess we'll count. The real accessory here is 3EV's soda jerk cap, which you'll undoubtedly use to reenact the classic scene in which he pulls his cap up off his head to reveal that wonderful third eye. On the subject of 3EV's outfit... well, if you've been reading along this week, you know that I have a huge problem with multiple layers of clothing on figures of this size (8-inch), as you end up with the dreaded EPS (Excessive Puffiness Syndrome). Here's a case where, miracle of miracles, the opposite happens! 3EV is wearing a short-sleeved shirt with collar under a cardigan sweater, and it's beautifully rendered. Unlike the suits-and-ties of other figures, this get-up doesn't look puffy or oversized at all: it fits perfectly. Further, the sweater sleeves are long enough to accommodate various arm poses. They should've used this same material --- whatever it is --- to construct the suit jackets for Bob Wilson/Don Carter and Henry Bemis. And short-sleeved shirts would have worked for them too... why not? Free up those arms for some posing! 3EV arrives in the usual blister pack, heat-sealed to a card. The newest figures are depicted on the front (all five of which we are spotlighting this week). 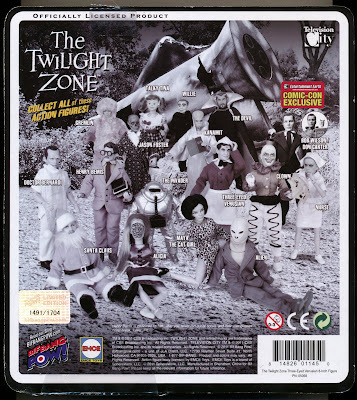 The back of the card features a delightful diorama featuring every single TZ action figure released so far, along with six figures not yet released (Santa Claus, Alicia, Maya the Cat Girl, Alien, Clown, and Nurse; those should hit in mid-2012). The Bob Wilson/Don Carter hybrid figure is marked as a Comic-Con exclusive; interestingly, last year's Willie the Dummy/Talky Tina pair is NOT marked as such. The wrecked spaceship in the background looks like it came from season five's "Probe 7 - Over and Out," which is a nice touch (wonder if we're getting a Richard Basehart figure at some future point...?). The new figures are limited to 1704 pieces each... my 3EV is number 1491. The Three-Eyed Venusian comprises half of "Series 5" in Bif Bang Pow's ongoing Twilight Zone action figure releases. 3EV, along with The Invader, can be purchased from Entertainment Earth here. Each action figure is limited to only 1704 pieces, so I'd suggest you expedite that order, cookie. While I may not be crazy about the character choice (especially when I still have a long list of desired TZ denizens that haven't been actionized yet), I can't deny that Bif Bang Pow! 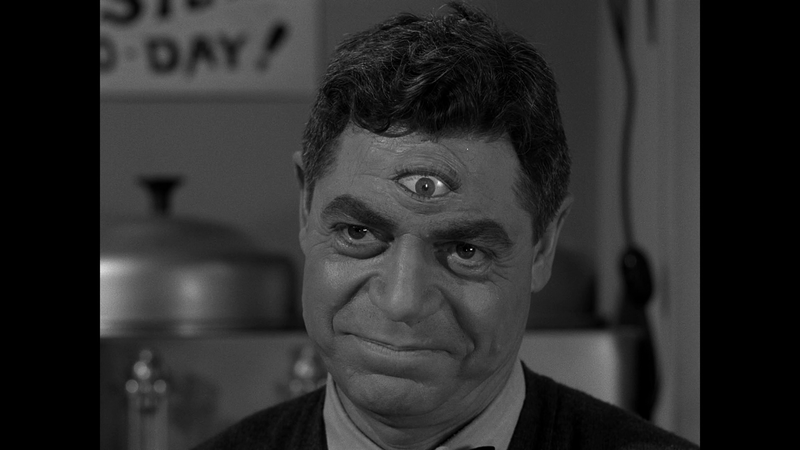 's take on the Three-Eyed Venusian is a complete and utter success. The combination of a great head sculpt and perfectly executed attire equals an absolute home run. He's paired with The Invader, who we'll spotlight tomorrow... so y'all come on back now, ya hear? Labels: Bif Bang Pow, Three-Eyed Venusian, TZ action figures, Will the Real Martian Please Stand Up? It looks like the Clown will still be coming out in 2012, just not as one of the next wave of six. The Clown is being replaced by the Cyclops from The Fear and the Clown is being held over for a different 2012 release along with four other figures. Sounds like a possible Five People In Search of an Exit set. The cyclops?!? Why would you make an action of a fricken hot air baloon!?!? Not to mention... its The Fear... shudder. Rag Status: Master Archive Collection complete! Merch Spotlight: Twilight Zone Cigarette Case!